Oshkosh, Wis.— Continental Girbau Inc.’s (Continental) presence at “Clean ’17” will showcase the company’s vast product breadth as the commercial laundry industry’s most diverse provider of on-premise, industrial and vended laundry equipment and solutions, according to President Mike Floyd. 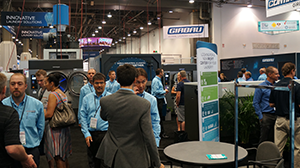 Continental booth 3215 is dedicated to on-premise and industrial laundry, while booth 3415 is vended-laundry focused. “During ‘Clean,’ Continental will feature new product advancements in folding automation, dryer programmability and washer technologies,” said Floyd. “We promise exciting booth interaction, educational product demonstrations, and valuable opportunities to speak with Continental end-users, distributors and team members.” During the show, visitors will also enjoy financing and product promotions. Once again this year, Continental’s Express Laundry Center® will also be a booth spotlight. Express Laundry Center is a nationally branded and turnkey vended laundry solution that teams high-speed ExpressWash Washers and ExpressDry Dryers with multiple services and local marketing and management support. Vended laundry products, new control technology and new machine introductions will also be featured.